The West Hollywood hotel industry experienced a 15.1% increase in revenue last year, reaching a total of $219 million. That is good news for the City of West Hollywood, whose hotel room tax is the largest single generator of revenue for the city’s General Fund. But the news, provided in an analysis of data by STR Inc., the hotel industry analytics firm, wasn’t so good for the city’s hotels. The occupancy rate last year was 77.5%, a 6 % decline from the 82.4% occupancy rate in 2017 and a decline of 10% from the 86.2% occupancy rate in the 2016, which was the highest in the past six years. The revenue per available room (RevPAR), another industry metric, was down 4.6% following a 5.6% decrease the year before. By contrast, RevPAR was up 10% in 2016 over the year before. While the occupancy rate was down, demand was up overall, with an increase of 13.5% in 2018 over 2017. Demand for rooms had increased by 2% in 2017 over the year before. The decline in the occupancy rate and revenue per room, along with the increase in the demand rate, suggests that the opening of new hotels in West Hollywood and surrounding areas such as Beverly Hills and Hollywood is having an impact on the existing hotels in WeHo. A negative impact was predicted in a study by PFK Consulting and CBRE Hotels that was presented to the City Council in September 2016. The study projected a major decline in hotel occupancy and in the rate per hotel room if the city granted permits to hotel projects currently under review on top of those that already were under construction or that already had been approved for construction. 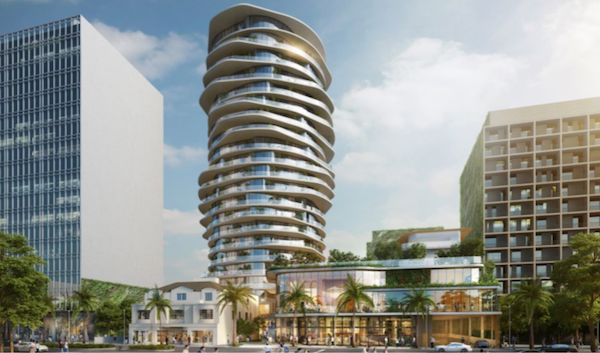 The analysis noted that WeHo hotel projects under review, under consideration and already approved for construction would add 1,229 rooms to the city’s current 2,060 hotel rooms, an increase of 60%. The study projected that by 2020 the hotel room occupancy rate would fall to 68% from the rate of 83% in 2015. It also said that the average daily room rate would fall to $243 from an average of $279 if both hotels that had been permitted but at that point weren’t yet under construction and those that were under review but not then permitted actually were built. Citing the study, City Councilmember Lauren Meister recommended in March 2017 that the city declare a two-year moratorium on hotel construction. That recommendation was not supported by her fellow council members, several of whom cited the advantage to the city of the increase in taxable hotel room revenue. The city taxes hotel room revenue at a rate of 15.5%, with an additional 3% going to the West Hollywood Travel + Tourism Bureau. Unite Here Local 11, the hotel and restaurant workers union, has proposed a 24-month moratorium on new hotel construction that will be on the March 5 city election ballot. Illustration of revised plan for 9034 Sunset Blvd., now 22 stories with the Crosby Building relocated to the east. Since the PFK / CBRE report, the James hotel, soon to be rebranded as the “1,” opened in August 2017 with 286 rooms. The La Peer hotel opened on La Peer Drive in January 2018, with 105 rooms, bringing the city’s total number of hotels to 20. Currently under construction is the Marriott Edition, a 190-room hotel on Sunset Boulevard at Doheny. The Pendry, a project of AECOM Capital and Combined Properties Inc., is under construction on Sunset Boulevard at Olive Drive, the location of the former House of Blues. It will include 49 guest rooms and 40 condos. It is slated to open next year. The city Planning Commission and City Council have approved plans for a nine story hotel with 241 rooms as part of the Robertson Lane project on Robertson Boulevard. The Planning Commission has endorsed plans for a nine-story building on La Brea Avenue just south of Santa Monica Boulevard with 85 hotel rooms plus another eight residential apartment units and a ground-floor restaurant and top-floor bar/lounge. A proposal by the Mani Brothers for converting the Piazza del Sol on Sunset Boulevard into a 34-room hotel has been blessed by the city’s Historic Preservation Commission but hasn’t yet been presented to the Planning Commission for review. A group that has proposed to convert the current site of Barney’s Beanery at 8447 Santa Monica Blvd. into an 88-room hotel along with 45 apartments has presented plans to residents at two community meetings. Yet to be seen is a plan for a proposed 115-room hotel on lots at 8850-8878 Sunset Blvd., bordered by San Vicente Boulevard and Larrabee Street. The Charles Company has proposed a 22-story tower with 237 hotel rooms and 10 affordable apartments on lots at 9034 Sunset Blvd. Jason Illoulian’s Faring, the builder of the Robertson Lane project, also has proposed building another hotel with as many as 130 rooms on the southwest corner of Robertson and Beverly boulevards. The recently approved Arts Club at 8920 Sunset Blvd. would include ten hotel rooms for members. San Vicente Bungalows, the hotel that has replaced the San Vicente Inn, has added three rooms. If all the proposed projects are approved, West Hollywood would have 29 hotels, with the new ones increasing the number of hotel rooms by about a third. Existing hotels also face competition from AKA Communities, the 110-room tower at 8500 Sunset Blvd., which offers rooms for stays of 31 days or more. And there is competition in Beverly Hills, the WeHo-adjacent community that in recent years has seen the opening of the Waldorf-Astoria and in 2019 will see the opening of the One Beverly Hills. 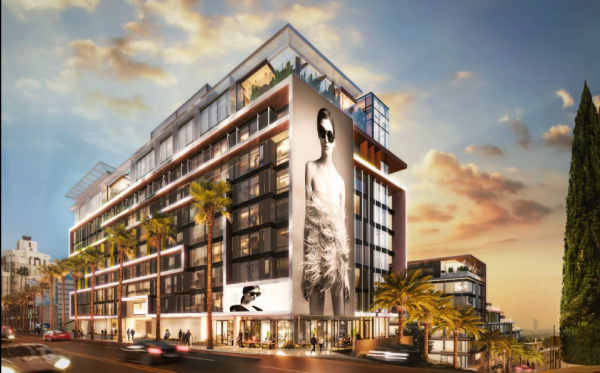 In nearby Hollywood, relatively new hotels include Dream Hollywood on Cahuenga Boulevard, the Kimpton Everly, the Hampton Inn & Suites, and the Thompson Hollywood, anticipated to open in 2019. I wish WeHo would form an exploratory committee to find other forms of revenue besides its obvious “sell-our-soul-to-hotel-overdevelopment” strategy. I bought a condo here to live in a community, not a hotel-opolis permanent construction site. If data shows they can’t fill the hotels, they won’t get the funding for them. Ms. Meister is right–and a moratorium will help with our AWFUL traffic problems too. Let’s start with decreasing all speed limits from 35 to 30 on local roads, as most other large cities do (we are part of Metro L.A. so we ARE large). There’s nothing to see anymore. For a city of our size to have as many hotels as we already do + all the projects that are proposed is ridiculous. Why don’t we just change the name of the city to Hotel City Adjacent to Hollywood? Why would anyone be paying an average rate of $250 to visit West Hollywood? Unless you’re here on business. What’s here to see? ….Or the endless parade of new buildings which Frank Gehry calls 98% sh—-t… ugly edifices that are turning WEHO into a perfect tribute to architecture you once could find in pre Berlin Wall East Germany. ….Maybe it’s goulish fascination with the Ed Buck matter and visiting the WEHO racist death house at 1234 Laurel Ave.
WEHO citizens need to have a “come to Jesus meeting” over all of this. The bottom line is the 3 Johns … Heilman, Duran & D’Amico … on the WEHO City Council are owned by all white male developers who do not live in West Hollywood. One of which is facing 10 years in prison for bribing city officials in a nearby city and is a D‘Amico big bucks contributor. It is my understanding finally a recent complaint has been filed with the FBI by certain local citizens regarding possible corruption at WEHO City Hall. Why would anyone stay in West Hollywood? For tourist we are a central location to the beach, Universal Studios, Hollywood, DTLA, Getty Museum. Our city is safe, walkable, and has one of the largest number of restaurants, and bars. Ideal for staycations, too. Indeed, there’s much more to see here. Sprawling nightlife, which is actually growing. The arts District. Shopping, etc. Adjacency to Beverly Hills and Hollywood. Some world-class restaurants. An actual walkable destination. And for some, it’s a status thing to say that they are staying here, or staying on the Strip. That said, they are definitely building too much, too fast. We should be building our way out of the housing crisis. Why so many damn hotels? Because regardless of campaign contributions, our Council is wooed by the idea of increased tax revenue. They should have conducted a study before approving all of these developments. Are we trying to turn into Las Vegas Blvd.? I think this study proves that these are not going to be sustainable, and Councilmember Meister was right. We shall see. The other four West Hollywood Council members, the three Johns and Horvath, were groomed by the all white male lobbyists to accept campaign donations from the all white male out of town developers to build more hotels and elitist private clubs. It’s called pay for play. And that’s what the FBI is probably investigating. I submit that the falling vacancy rate is also a function of this-far poor enforcement against AIRBNB violations that are sapping he demand for hotel rooms even as they illegally choke off the supply of housing for people that actually LIVE here. Fix that, and I expect that hotel rooms vacancy rates & revenue will be better…and housing costs for apartments which are SUPPOSED to be dedicated to LONG-term rentals will be less outrageous. Rick Watts, everybody agrees that any AirBnB rental that is not the residence of the host, who is present when the guests are there, is absolutely unacceptable. So let’s put to bed the claim that AirBnB is choking off the supply of housing in WeHo. This is one of several myths and misunderstandings about AirBnB. When RevPar + Occupancy rate decline, but Total Demand increases all this = equals the Absorption Rate of new hotels. In this case the Absorption Rate overrides the individual metrics and shows that we can continue to bring new hotels to market. One benefit of a decrease in occupancy rate is a moderation of price increases. Net Net – bottom line is the absorption rate and demand is so strong that we can aadd more hotel rooms and do not need a moratorium. A moratorium only allows current hotels to keep prices high and stifles competition.